"Have we ever... handled any murders for him before?" - Lutie Beagle (Torrey Chanslor's Our First Murder, 1940). 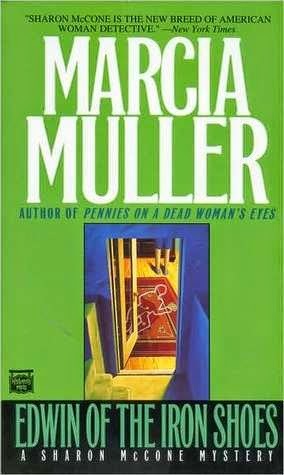 Marcia Muller and Bill Pronzini are acclaimed crime-and mystery writers in their own right, creating the celebrated private-eyes Sharon McCone and the Nameless Detective, but their masterstroke came when they decided to merge their universes and throw everything together – even when the characters were a century apart (e.g. Beyond the Grave, 1986). Edwin of the Iron Shoes (1977) was the debut of "the founding mother of the contemporary female hardboiled private eye," but the plot is very traditional and that's how I really prefer my private-eyes – not too hard boiled. The epicenter of Edwin of the Iron Shoes is Salem Street, where the careworn buildings provide housing for a clutter of antique stores and junk shops, but, recently, their owners have been on the receiving end of vandalism mingled with arson. Intimidation that eventually culminates in murder of one of the shopkeepers. Joan Albritton owned a small shop, Joan's Unique Antique, which is where her body was found – stabbed with a bone-handled knife snatched from an open display case. The inoffensive antique dealer was a client of All Souls Cooperative, a legal firm to help the unfortunate ones in society, and they sick their staff investigator on her murderer. Sharon McCone has more than enough leads to sort out and suspects to follow up on. Firstly, there's the possible connection between the acts of vandalism and an impending real-estate deal with a cold and vindictive mogul, Cara Insgall – which also attracted the attention of a shady bail bondsman, Ben Harmon. A character who's about as hand tame as Max Hook from the mystery stories by Craig Rice. Secondly, there are the suspects that are a lot closer to home. Oliver van Osten was one of Joan's antique dealers and more than willing to put his knowledge at McCone's disposal. Or Charlie Cornish, owner of the Junk Emporium across the street, who had a relationship with Joan and disapproved of her seeing Harmon. What's the role of the wood-carved little-boy mannequin, named Edwin, wearing ornate iron shoes? Muller penned an ambitious first mystery novel that stands pleasantly closer to the works of the then (semi) retired generation of writers than the hardboiled private-eye Muller is associated with today, but hey, that's just my personal bias for pure detective stories rearing its ugly head again. Edwin of the Iron Shoes does reflect the talent Muller (and Pronzini) has for creating characters without sacrificing the plot, which is commendable, but my favorite part was when McCone spend the night at the crime-scene – where she had a brush with a night-time intruder after a vivid dream and probably had her first argument with a police lieutenant over the course of a murder enquiry. Or how McCone sneaked into places she wasn't suppose to be and how her theory was crushed when her handpicked murderer became another victim. The inevitable confrontation with the murderer got a smile, because, this being the first in the series, the training wheels were still on and McCone only had to fear for her life at knifepoint – instead of arguing over the barrel of a gun. What I'm trying to say is that characterization can be a wasted effort when I'm reading the book. The only (minor) complaint I have is the identity of the murderer. I kept hoping it wasn't this person, because it was too easy, but absolutely forgivable for a debut novel. So, all in all, not a bad start of what blossomed into a successful series. "There was, too, not only the past, but a sinister present. The shadow of murder and a murderer haunted the house." Wadsworth Camp is as obscure as most of the names listed on the Golden Age of Detection Wiki or mentioned in Locked Room Murders and Others Impossible Crimes (1991), but cross-searching them placed two novels by Camp on my wishlist – one of them being The Abandoned Room (1917). The Abandoned Room was published in the same year as the United States' entry into World War I, during which Camp served as a war correspondent and probably had a brush with mustard gas. Camp most likely wrote the book before the war, but didn't feel the need at that moment to include any reference to the armed conflict that the world was entrenched in at the time. It strangely enough feels like reading a thoroughly British country house mystery as perceived by R.M. James. Spook Central would've been a good name for the ancestral home of Silas Blackburn, called The Cedars, which he delivered back to the "swift, obliterating fingers of time." A thick and dark forest with patches of stagnant lakes surrounds the home. There's a disused, overgrown family graveyard on the rundown grounds and at the core is the abandoned bedroom, in which many generations of Blackburn's died anguish – usually of a head injury. Silas' great grandfather had been brought to that room from a "Revolutionary skirmish" and his father picked the room to shoot himself in, which are just two of the cozy family stories. However, Silas is afraid that his cousins, Katherine and Bobby, might want to prevent him from changing his will and takes refuge in the old bedroom. Both doors are locked from the inside. And, predictably, Silas is found murdered in his bed, but here is where it gets weird. Robert "Bobby" Blackburn was on his way to his uncle on the evening of the murder, but wakes up the following morning in an abandoned, ramshackle house well-nigh The Cedars – without shoes or his most recent memories. The possible motive of securing an inheritance and a sudden memory gap makes him the prime suspect for the county detective, Howell, which is strengthened with a footprint matching his and a monogrammed handkerchief found underneath the bed. Yes. There are moments when the story shows its age. However, you probably won't mind them as much once the abandoned room has you in its spell ("I'm possessed by this house and can never leave it again!"). Anyhow, the seemingly impossibilities continue to pile on at The Cedars: Silas' body is moved mysteriously inside the death room, which becomes soon the scene of an identical and equally baffling murder. And there are, of course, more suspects to consider. Why was Katherine always the first to notice there was something happening in that room? What is the real purpose of Carlos Paredes' presence at The Cedars? Why is Dr. Groom so keen to point out the haunted history of the place and suggests they might be fighting the dead who resented the intrusion of the living? Surely, there must be something up with a butler named Jenkins! However, the main attraction remains the thick atmosphere and allusions to ghostly inhabitants of the grounds that is pulled over this story, which is really well played in the second half of the novel – and features another impossible situation or two. Bobby wants to rifle the pockets of the second victim for important papers and the otherwise unoccupied room is being watched by Katherine, but the papers vanish practically in front of his eyes and upon touching the corpse he "felt death cease to be death" for a moment. I can imagine this particular scene could've impressed a very young and imaginative John Dickson Carr. These apparently supernatural crimes persist and they're used to great effect, but the problem is that they revolve around a gimmick that was out-of-date even by 1917 – as reasonable and convincing as it may have been brought. Camp gave a good explanation why it was missed, but I think he should've continued working on the implied solution that arose when everyone began to think "that the void between the living and dead had, indeed, been bridged." Again... Camp was evidently a master at the oldfangled art of presentation-and effect. What it lacked was an extra punch of originality (see: locked room solution) to push it as one of the early classics of the locked room sub-genre. Now The Abandoned Room only gives us bragging rights about how the Detective Story stole Camp away from the Ghost Yarn. So what do you think about that Dr. Crowe? Finally, for those interested, the blog Bill Ectric's Place has compiled bits and pieces of information on Wadsworth Camp from around the web. "Now, I give you fair warning... either you or your head must be off, and that in about half no time!" The penname of Frederic Dannay and Manfred Lee, "Ellery Queen," is synonymous with such tropes as the "Dying Message" and "A Challenge to the Reader," in which the reader is invited to pick up the gauntlet and solve the problem them self. So, not very surprisingly, I wormed through practically the entire series when I discovered the phenomenon known as the Golden Age detective story. There is, however, a problematic issue I have nurtured over the years regarding their locked room mysteries and impossible crime tales. They can be too clever for their own good (The Chinese Orange Mystery, 1934), mind numbingly obvious (The Door Between, 1937) or shoot themselves in their own foot with a daft explanation (The American Gun Mystery, 1933), but the worst of them are the ones that are actually pretty good – except that they are buried in bad or little-known, short stories. The King is Dead (1952) and A Room to Die In (1965) are examples of good locked room ploys stuck in horrendous novels and "The Three Widows," from Q.B.I. : Queen's Bureau of Investigation (1955), is a case-in-point of a good, but obscure, story that has one of their cleverest impossible methods. "Snowball in July," from the same collection, also deserves a mention, because it came up with an alternative solution to make a train disappear between two stations. Well, I stumbled across another one of their great ideas for a baffling locked room scenario, but, even more baffling, it was condemned to obscurity from its conception. 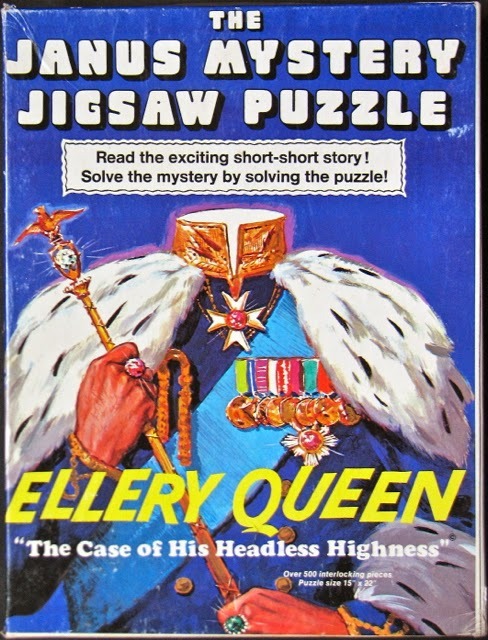 The Case of His Headless Highness (1973) is a Janus Mystery Jigsaw Puzzle with a short, open-ended story by Ellery Queen on the back of the box. You're supposed to solve the mystery before finishing the puzzle and the complete picture will show if you were correct, which is a novel idea, except that it probably didn't reach the audience that their novels, magazine stories, radio plays and TV-and movie adaptations had. The Case of His Headless Highness begins with Ellery Queen and Inspector Jiggs standing over the slain remains of "His Royal Ex-Highness King Musaka of Zharkan," who escaped to America after a revolt and the new ruler has put a bounty on his head – which made Musaka particular suspicious and wouldn't allow anyone in his room at the boarding house. Musaka was basically a hermit with a strong lock on the door with a peephole in it and the only person allowed to enter was his loyal servant, Igor, but someone still managed to pass the secured door and get away with the king's head! What makes the solution particular interesting is that it doesn't hinge on manipulating locks, windows or your perception of time-and space, or the "blinkin' cussedness of things in general," but on how to lure a recluse out of a tightly locked room – and still make it appear as if the killer had all the maneuverability of Jacob Marley's ghost. If The Case of His Headless Highness (or idea) had been fleshed in an actual short story, it probably would've been one of their most well-known shorter works of fiction and delivered another classic locked room mystery rivaling "The Lamp of God" (from The New Adventures of Ellery Queen, 1940). But what did they do with it? A one-page, opened ended story on the back of a box for a jigsaw puzzle! You can read the story for yourself at Ellery Queen: A Website on Deduction and at the end of the page, you can click a link to a picture of the completed puzzle showing the solution. By the way, Dannay was reputedly fond of changing story titles when he edited Ellery Queen's Mystery Magazine and couldn't help but think that The Call of the Land Pirate would've been a great alternative title. If you have read the story and saw the pictured solution, I recommend you read this definition of "Land Pirate" and you'll have to agree with me. "In my cases, sir, you can have practically everything." 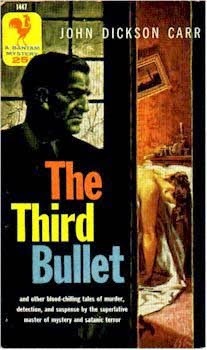 The Third Bullet and Other Stories of Detection (1954) is a collection of short stories by John Dickson Carr, one of the Old Masters of the Impossible Crime tale, who seldomly disappoints – even if I knew a few stories from other books and incarnations (i.e. radio plays). 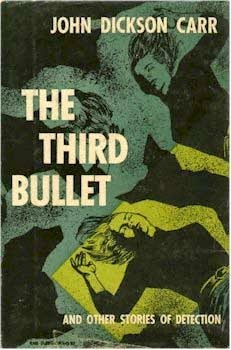 A novella, "The Third Bullet," opens the collections and stars a prototype of Colonel March (e.g. The Department of Queer Complaints, 1940), Colonel Marquis, tasked with looking into the seemingly impossible shooting of Charles Mortlake. Mortlake was shot in his pavilion, which exits where either bolted shut or under observation and the evidence points to one person. The explanation follows Merrivale's Law of the "blinkin' cussedness of things in general," which made an extremely confusing murder appear to be completely impossible, however, it's main weakness is its length. It should've been much, much shorter. I can also recommend the mini-anthology Locked Room Puzzles (1986), which includes this novella and three others by Bill Pronzini, Clayton Rawson and Edward D. Hoch. "The Clue of the Red Wig" details the peculiar circumstances surrounding the murder of Hazel Loring, a columnist with a loyal following of housewives who read her weekly column, "Smile and Grow Fit," whose denuded body was found on a park bench in Victoria Square on a cold December night – most of her clothes neatly folded besides her. A young, cheeky Franco-British journalist, Jacqueline Dubois, takes on the case on behalf of the Daily Record and helps Inspector Adam Bell find a clever answer to the baffling problem. Miss Dubois herself brings some Gallic flair to a quintessential English detective story, saying such things like "hot ziggety dame!" and offering to make love to the Assistant Commissioner in exchange for a scoop. And, of course, casting a young, French journalist as one of the detectives is nothing more than a poorly disguised nod and a wink at one of Carr's favorite locked room mysteries, Le Mystère de la chambre jaune (The Mystery of the Yellow Room, 1907) by Gaston Leroux. "The House in Goblin Wood" is one of few short story appearances for the Old Maestro, Sir Henry Merrivale, and it's generally considered to be on par with the best full-length cases of H.M. Twenty years before the opening of the story, a young girl, named Vicky, disappeared from a house that was locked and bolted from the inside – only to reappear a week later with a story of having lived with the fairies. When she returns to the house two decades later, she disappears again under similar circumstances, however, this time it becomes a grim fairy-tale. This is like G.K. Chesterton at his best: treacherously benevolent on the surface. "The Wrong Problem" is a semi-inverted mystery with the tendency to twist and turn, in which Dr. Gideon Fell has a talk with a man by a lake, located in a valley in Somerset, about a crime that has been buried in the distant past. There's an artificial island in the lake with a summerhouse and the man was suspected to be responsible for the death of two of his family members, who died in the summerhouse. One of them in a bare, top-floor room with bars decorating the sole window and the only door was under constant observation. The method was recycled from another story, but, as a whole, it was nice, leisurely and well clued detective story. "The Proverbial Murder" involves the fatal shooting of Dr. Ludwig Meyer, a German refugee, working a dissertation on atoms and the police surrounded the cottage at the time, because his English wife had reported him as a spy. Ardent readers of Carr will probably figure out large swats of the solution before Dr. Fell. There are bits and pieces that cropped in other stories, but even without that it's not that difficult to get on the right track. A simple, but nice, detective-meets-spy story. I was already familiar with "The Locked Room" as a radio play, in sound and script, in which a book collector, Francis Seton, is assaulted inside his locked and guarded office, but Dr. Fell makes short work of the problem. And, to be honest, the story is a notch or two below Carr's best and the locked room problem/solution impressed me as sloppy in their presentation. Not all that bad, but also far from the best. "The Man from Paris" shows why John Dickson Carr is grossly underrated as a writer of historical mystery-and adventure stories and here he combines it with his talent to imitate 19th century fiction writers. In the Dr. Gideon Fell mystery The Mad Hatter Mystery (1933), Carr wrote a completely imaginary, but very convincing, passage from a lost Edgar Allan Poe tale. Here a Parisian travels to America to right a wrong, but is confronted with a dying woman and her will that has disappeared under impossible circumstances, however, as a mystery, it’s only of interest for the secret identity of one of the characters – and the historical atmosphere of mid-19th century America, if you enjoy historical mystery. By the way, while I was reading the story, I suddenly wondered who the president was at the time and the story immediately answered with a reference to Zachary Taylor. As to say, here dummy. Hey, it could've been James Polk, right? And thus concludes my first, proper review in what feels like ages and I have still failed in giving my all-time favorite mystery writer a bad review, which I solely blame on Carr for insisting on being an unapologetic mystery writer. 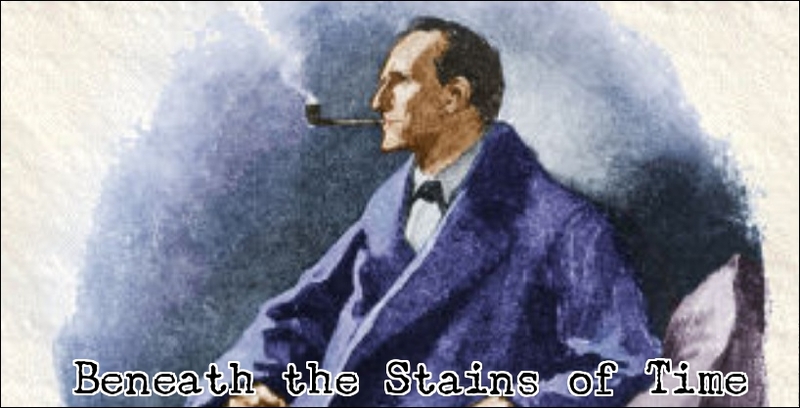 I mean, how can snooty purist like me take umbrage at a man who loudly proclaimed: "...I wanted to write detective stories. I don't mean that I wanted to write great novels, or any nonsense like that! I mean that I simply damn well wanted to write detective stories." It's an attitude that's strongly reflected in his work and it's a stance that's still hugely appreciated! "X. The unknown quantity, who may upset all our calculations. It's fatal to forgot him. Whenever you make a list of possible criminals, you are apt to put yourself in the blinkers and forget that anyone exists outside of your list. Always put in X, and keep a sharp look-out for him." "Cyril Hare" was the adopted pseudonym of Judge Alfred A.G. Clarke, who drew liberally from his education and professional background for his mystery novels. Clarke had studied law as well as history and was called to the Bar in 1924, where he worked as a barrister in the criminal courts, until the outbreak of World War II – during which he served as a judge's marshal. In 1950, Clarke became a judge and traveled the court circuit. A "gig" that was at the heart of what many still consider to be Hare's masterpiece, Tragedy at Law (1942), which I would recommend for the portrayal of the life of a Circuit Judge alone. Tenant for Death (1937) was the first to appear under the Cyril Hare byline and plays on the motif of the shady financier that gained popularity in the years following the Wall Street Crash of 1929. In a way, Tenant for Death is a bit different from other Hare mysteries I have read, because the resolution wasn't a matter of law or hinged on a passage from history. There is, however, a clever piece of misdirection revealed in its conclusion and, while it's a dry read at times, the story displayed what we'd call today a social conscience – which translates in bits of social commentary and subtly showing the difference in lifestyles between the poor and rich. Nevertheless, judging by the story's content, I doubt Hare's political sympathy was with the left. There's an amusing scene, in which a communist lorry driver picks up one of the characters (ex-jailbird), but when the driver finds out his passenger is wanted for questioning he dumps his comrade in the middle of nowhere. In the pouring rain. Leaving him with nothing more than the clothes on his back and an empty tin jug. Hare saw the social problems of his time, but a solution uttered by one of the other characters, on how it's good for young people to do Empire Building in Kenya instead of loitering in the Old Country, would be considered politically incorrect in today's world. 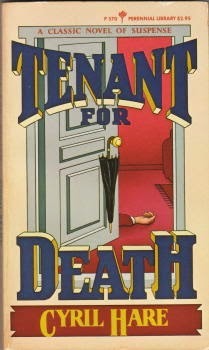 Anyhow, enough of the background noise in Tenant for Death and lets turn to the plot itself, which focuses on the business endeavors of Lionel Ballantine, the mystery man of financial world, who balanced his businesses between a dozen different companies – known as the "Twelve Apostles." Unfortunately, Ballantine's business model has stopped working and disappears before everything comes crashing down around him. Ballantine's escape, however, ended in a dingy, obscure place called Daylesford Gardens, South Kensington. Two estate agents checking the inventory of the house discover the strangled remains of Ballantine in the smoking room of the house. A newspaper saw the previous tenant, Mr. Collin James, enter the building with an unknown man, but left the place by himself. Enter Inspector Mallett, whose unraveling of the case is a slow, meticulous yet satisfying process, but the downside is that it slackened the pace of the story considerably. On the other hand, Tenant of Death balances plot, detective work and characterization satisfactory and Hare allows the reader to drift on a treacherously slow tempo towards the final chapter – where he took me by surprise. And about the opening quote, I think Hare should've gone with The Unknown Quantity as book title. It fits the story better and does justice to the clever solution. I should probably also reference Trent's Last Case (1913) by E.C. Bentley, which is an obvious comparison made before, but thought Tenant for Death shares some common ground with Nicholas Blake's There's Trouble Brewing (1937). Not just for their political tone, but also in the kind of (detective) problems they explore in different settings and explanations. And, interestingly enough, they were both published in the same year. Tenant for Death is a solid, but slow moving, detective story and a better-than-average debut novel in this genre, which may prove to be treacherous grounds for smug and seasoned armchair detectives. Lastly, if you're interested in giving this fox posing as a hare a shot, I would recommend the previously mentioned Tragedy at Law, Suicide Excepted (1939) and An English Murder (1951).